“Christene’s Fires”, acrylic on Masonite, 1984, is about an interior time of year. With babies in bed, my reflection catches in the oak buffet we brought home from Robert’s cottage. Its flickering bevel mirrors my younger life and another rooms’ Christmas. Before studio, the Masonite panel was angled between my lap and the dining room table. Overlaid glazes, in an attempt to savour the flame and its light, slowly formed the waxy red candles, the thick silvered glass, and the brassy bright sticks. As if explaining the rest of my home, my little grey face face explains that this is where my heart lies. I assumed that I was my mothers daughter, but lately understand that I am also my fathers’ daughter. Dad found value in everything he did from packing meat in a processing plant to selling insurance. I also value everything including the flaming fires that once sat on the oak server. That oak buffet was the final piece sold at auction before the old house sold. Saying goodbye to that part of my life was very hard. I value this painting because it suggests that I might look for a new bevelled mirror – one that will fit onto the shelf of a new-to me, old oak book case that resides in my new dining room. 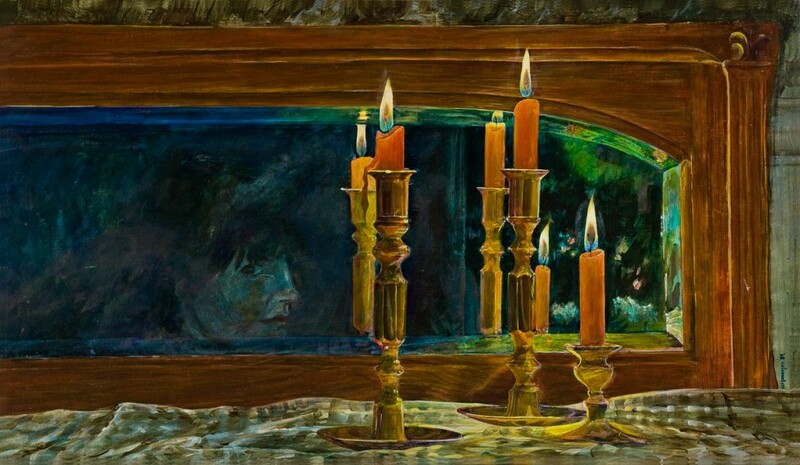 I love still life practise and perhaps once again I will come to enjoy this interior time of year by candle light. Very interesting , love it thank you for sharing.